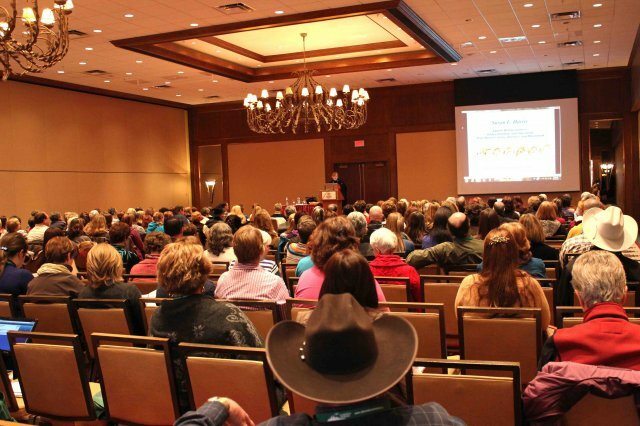 It may have been Friday the 13th, but superstition did not deter horse enthusiasts from all over the country to attend the 30th Annual Horse Breeders and Owners Conference, held again this year at the Sheraton Capri Hotel, in Red Deer, Alberta. 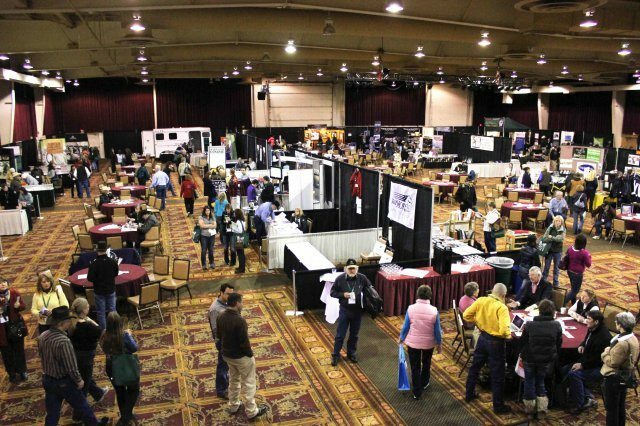 A total of over 520 people were onsite from Alberta, British Columbia, Manitoba, Ontario, and Saskatchewan and the exhibit hall hosted over 60 booths sponsored by equine businesses and organizations. The weekend kicked off with the Stable Owners Seminar on Friday afternoon. The four sessions were specifically designed for the stable industry. Topics on biosecurity, bits, positive networking and social media were presented by Dr. Darrell Dalton, Ron Anderson, Nettie Barr and Andrew Campbell. Saturday began with Terry Grant, famous for appearing on the popular reality TV show Mantracker, who spoke about his life experiences in an interactive session sponsored by Alberta Equestrian Federation. After the coffee break, generously sponsored by Western Horse Review, delegates had the choice of attending a trailer loading session given by Dr. Andy Anderson, Susan Harris speaking about athletic movement in horses and Dr. Frank Andrews educating people about preventing the risk of colic. Thank you to break-out session sponsor Canadian Horse Journal. The hour and a half lunch break gave delegates more time to visit the sponsor booths after grabbing some food, and then returning to the educational sessions. Ron Anderson shared his knowledge about bits, Dr. Connie Larson spoke about feeding the equine foot and Dr. Charles Briggs examined the use of medications in the competition horse. Sergeant Derrick McGougan presented to a full audience about how the Calgary Police Service selects and trains their horses, Dr. Vern Baron presented common sense information about the fructans in Alberta’s grasses, and Katie Tims, editor of Quarter Horse News, spoke about the evolution horse market in recent years. The News Hour session is the last session of the day, offering information on current issues in the horse industry. Dr. Duane Landals from the ABVMA updated the audience on biosecurity initiatives and antimicrobial resistance, Dr. Greg Andrews from Moore Equine Veterinarian Centre spoke about the outbreak of nEHV-1 that occurred earlier in 2011, and Jody Wacowich from AFAC spoke about the ALERT Line. Saturday night, sponsored by Horse Racing Alberta, offered live music by Randi Boulton, a host wine bar and cheese and dessert, and an equine sporting event. This year, teams were organized and competed at pole bending on a scooter, which was provided by Sparks Innovations. Team mates had to exchange funny costumes before the next team mate could start on this timed event. Competitors were organized into different teams including, a breed group, speaker, veterinarian, newbies, long-time conference attendees, and an all-star team. Ron Anderson announced the relay race and Pete Fraser had the difficult job of judging. However, the speaker team won with the fastest time, and likely got the most laughs as Terry Grant, Mantracker, ran the race in a red sequin gown. All participants received prizes provided by Horse Racing Alberta. Dr. Andy Anderson took the stage again on Sunday morning; his session was sponsored by Farmfair. Running concurrent to Dr. Anderson’s session was Dr. Lori Warren speaking about conditioning principles and Andrew Campbell educating about the world of social media. Following the final coffee break, Dr. Lori Warren presented again, this time on nutrition, Dr. Jason Bruemmer spoke about stallion breeding options and technologies and Dr. James Carmalt updated delegates about new diagnostic technologies. The final session of the conference is always the very important SPCA Fred Pearce Memorial Lecture dedicated to the welfare of the horse; this year, it was presented by Dr. Ed Pajor from the University of Calgary who spoke about the changing social ethic in regards to animal welfare not only equine welfare, but of production animals as well. 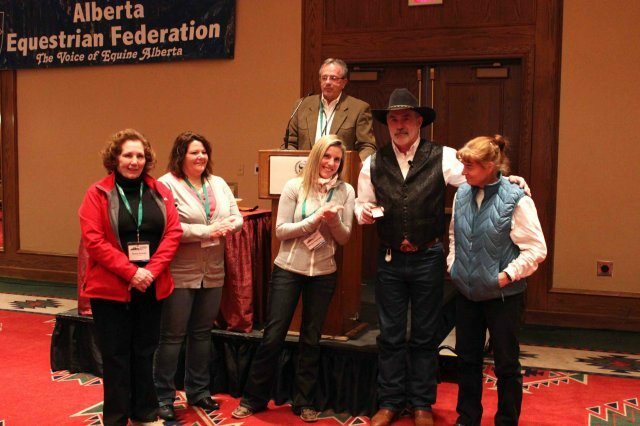 The Horse Industry Association of Alberta thanks everyone who attended and sponsored the event as well as the 20 presenters who brought their expertise and experience to Red Deer, Alberta.